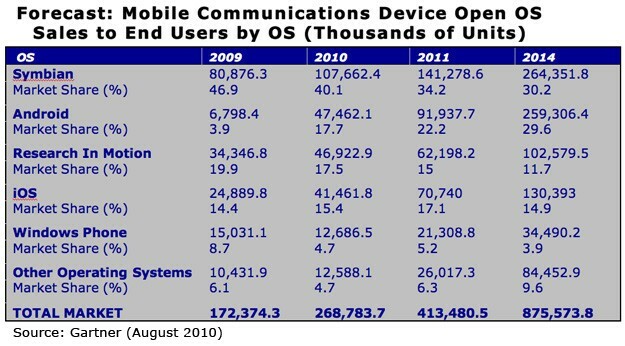 Google's (GOOG) Android mobile operating system continues to make major inroads in the cell phone market. In fact, Android will shoot from a mere 3.9% global market share in 2009 -- the year it effectively launched -- past an estimated 17.7% this year to a whopping 29.6% market share by 2014, according to a new report from research firm Gartner. Symbian, the operating system that powers devices made by Nokia (NOK), the leading mobile phone maker, is expected to remain in the top spot in 2014 with 30.2% market share, according to Gartner. "The worldwide mobile OS market is dominated by four players: Symbian, Android, Research In Motion (RIMM) and iOS," said Roberta Cozza, principal research analyst at Gartner, in a statement. "Launches of updated operating systems -- such as Apple (AAPL) iOS 4, BlackBerry OS 6, Symbian 3 and Symbian 4, and Windows Phone 7 -- will help maintain strong growth in smartphones in 2H10 and 2011 and spur innovation." "However," she added, "we believe that market share in the OS space will consolidate around a few key OS providers that have the most support from CSPs and developers and strong brand awareness with consumer and enterprise customers." Garner says that Android will be poised to "challenge" Symbian for the No. 1 position by 2014. The firm expects that by 2014, open-source platforms will control more than 60% of the smartphone market. "Single-source platforms, such as Apple's iOS and Research In Motion's OS, will increase in unit terms, but their growth rate will be below market average and not enough to sustain share increase," Gartner said in the study. "Windows Phone will be relegated to sixth place behind MeeGo in Gartner's worldwide OS ranking by 2014."